Baking homemade gluten-free bread without the benefit of the almost magical baking properties of gluten can be challenging, but definitely possible. 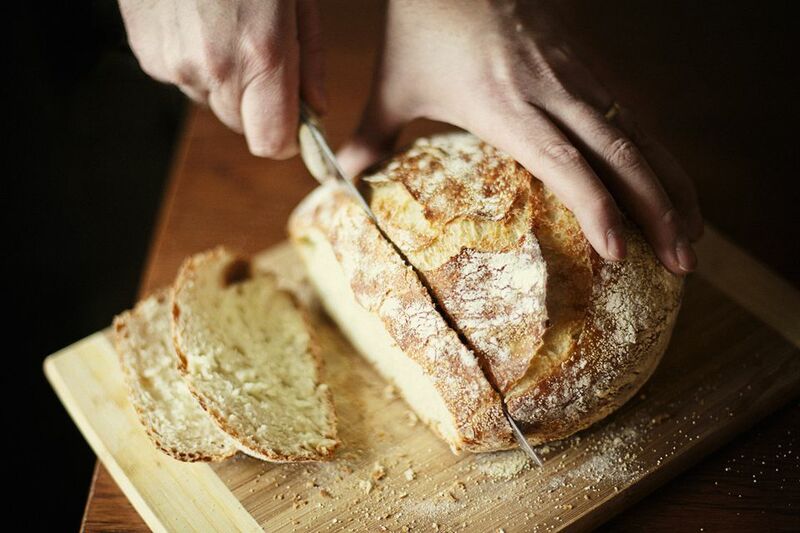 Here are some practical tips to help you bake better gluten-free bread. Yeast loves a warm environment and bread will rise more quickly and completely when ingredients are at room temperature rather than cold. Gluten-free flours are often stored in the refrigerator or freezer. Using chilled ingredients will significantly slow the yeasts' ability to leaven bread. A convenient way to bring chilled flours to room temperature is to measure flour(s) for your recipe and place in a bowl on the counter the night before baking. For perishable ingredients, like eggs and milk, set on the counter about 2 hours before preparing your recipe. Just like bread made with wheat, high protein content in gluten-free flour adds structure and flavor. Sorghum, millet, amaranth, teff, gluten-free oatmeal, and buckwheat all contain more protein than rice flour. Eggs are natural leaveners that help boost the rise and volume of bread. Eggs also add moisture, flavor, and protein to gluten-free bread recipes. Carbonated liquids contain carbon dioxide bubbles that promote volume in bread loaves. A gluten-free beer has the added benefit of adding flavor to bread recipes. Yeast thrives in an acidic environment, which promotes better volume in your loaves. Ascorbic acid also acts as a natural preservative, increasing the shelf-life of your bread. Most health food stores sell powdered ascorbic acid. Connie Sarros uses this ingredient in bread recipes found in her excellent gluten-free cookbook, Wheat-Free, Gluten-Free Reduced-Calorie Cookbook. It really works and adds moisture to gluten-free bread recipes. Olive oil is a healthy cooking oil that adds wonderful flavor to bread. Another benefit of using olive oil in bread recipes is that it adds moisture, a tender texture, and extends shelf-life of your gluten-free bread. Note: You can omit the fresh rosemary and walnuts in this gluten-free bread recipe for a wonderful, crusty everyday sandwich bread. Pectin is frequently derived from citrus fruit and apples and is a familiar ingredient in jelly and jam recipes. Pectin also promotes moisture retention in bread and can be used as a vegan substitute in gluten-free bread recipes. Look for citrus or apple pectin at health food stores or at grocery stores where jam and jelly making ingredients are kept. Expandex adds wheat-like texture to gluten-free bread. It can be added directly to your mixes or you can use a mix like Jules' Gluten-Free All Purpose Flour Mix which contains Expandex. My recipe for Gluten-Free Honey Buckwheat English Muffins is made with Jules Gluten-Free Flour Mix and this is my family's favorite gluten-free "bread" recipes. Go buy one of these priceless, yet inexpensive gadgets. A digital, or "instant read" thermometer will save you lots of frustration because it lets you easily measure the internal temperature of your bread. When the internal temperature is approximately 206 degrees F it's done. No more gooey loaves - no more dried out loaves! For best results, at least when you are learning to bake gluten-free bread, use recipes specifically developed for gluten-free bread. After you get a feel for the different properties of gluten-free flours, the amount of liquids and gum required and the different techniques used to make gluten-free bread, you'll be able to experiment with converting tradition bread recipes to gluten-free recipes with better success. Try baking gluten-free bread in lidded Pullman, also called Pan de Mie loaf pans. These pans have a lid that slides on the top of the pan. The closed baking environment encourages loaves that bake evenly, with excellent shape, texture and moisture retention.Look for lidded Pullman loaf pans at King Arthur Flour or check out this smaller Pullman loaf pan at Kitchenworks. An easy way to create a good environment for gluten-free bread to rise is to turn your oven to 200 degrees F. When it reaches this temperature, turn the oven off and place a shallow baking pan partially filled with hot water in the oven. Lightly cover the loaf pan with a damp towel and place in the oven for 20 to 30 minutes or until the dough rises to the top of the loaf pan. This method really does speed up the time it takes for gluten-free bread to rise. Just be sure to carefully watch the process so that your bread does rise over the top of the pan before baking. Fill loaf pans no more than 2/3 full with gluten-free bread dough batter. When loaf pans are over-filled bread may collapse as they rise and bake and you can end up with not-so-normal looking loaves of bread that may unevenly bake. I hate it when this happens! Gluten-free flours require more liquids than wheat flours to produce good baking results. If you choose to convert a traditional bread recipe to a gluten-free bread recipe you will need to add more liquid than the recipe calls for. Your gluten-free bread batter should be too soft and sticky to knead but not as thin as cake batter. If you've ever made banana bread, your bread batter should have a similar consistency, thick, shaggy and sticky.